If you struggle with your weight, you are not alone. Millions of Americans are considered overweight, and 100 million of them are considered obese. Dr. Joseph Naim understands the physical discomfort and self-consciousness you are experiencing. For this reason, he offers the trusted, proven LAP-BAND® procedure at his Long Beach office or one of his other four locations in Los Angeles and Orange County. LAP-BAND® reduces the size of your stomach, helping you to become full faster and ultimately eat less. There are several known LAP-BAND® benefits. The resulting weight loss not only helps you to look and feel better – it can also help you avoid serious health issues such as diabetes, heart disease, sleep apnea, and high blood pressure and cholesterol.Contact us to learn more. will narrow the upper portion of your stomach, allowing food to only pass gradually. This reduces the size of your stomach, which means you can feel full after eating less. Many patients prefer LAP-BAND® over other types of bariatric surgerybecause it is reversible and does not involve staples or the removal of any portion of your stomach or intestines. As with any weight loss surgery, the results of LAP-BAND® depend on your dedication to a healthy lifestyle. Proper diet and regular exercise are necessary for weight loss. To ensure significant and long-lasting results, you should begin eating three small, high-protein, low-carb meals every day with no snacking in between. Eating too much or too quickly can cause nausea and vomiting. Dr. Naim will work with you to create a diet and exercise plan that fits with your life and health. In fact, studies have shown that LAP-BAND® patients lose an average of 40% of their body weight during the first year. 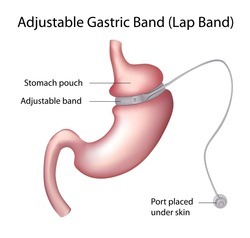 Though patients who choose LAP-BAND® do not typically drop as many pounds as those who chose gastric bypass, the results are still significant, and many patients appreciate the fact that the gastric band can be adjusted later on to meet new needs and health issues. LAP-BAND® is not recommended if you have digestive disorders such as Crohn’s disease, advanced heart or lung disease, pancreatitis, portal hypertension, or a genetic history of autoimmune connective tissue disease. Several factors affect the final cost you can expect to pay for LAP-BAND® surgery. Dr. Naim and his team can help you understand these costs and explore financing options. The majority of patients with insurance coverage receive partial or full coverage for LAP-BAND®. We also provide in-house financing and can recommend other financing solutions.